Here is a Southern-Thai recipe, as the southern people often use fresh turmeric in their recipes. Our recipe would typically be made with a "gai ban", or free-range chicken that roams around outside your own house. Served with a dish of home-made spicy sauce on the side, this soup is really delicious and unforgettable. In a mortar and pestle, pound garlic and chiles together, but do not over pound it. You should still be able to see chiles and garlic. Add lime juice, fish sauce, salt and sugar. Stir this together until the liquid is dissolved, and the taste should be sour, salty and spicy (priow, kem, ped). Add 8 cups stock to a pot, bring to a boil over medium heat. Add the lemongrass, galangal, turmeric, garlic and lime leaves. Allow to boil for a minute or two, then add chicken. After another minute or so, add tamarind and salt. Let the soup cook over low heat for 30 minutes. During this time, remove any bubbles/foam that appear in the pot. Taste your soup, then add extra tamarind if you like it more sour. Your soup is now ready to serve. 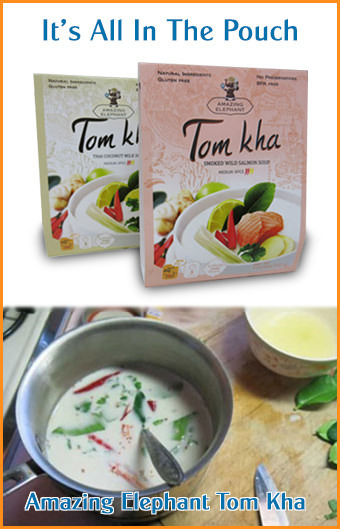 Many people like this soup to be spicy like tom yum, to get that flavor add a few fresh Thai chiles to your soup. The best way to serve this is with a generous bowl of spicy sauce "namjim" on the side, so it can be spooned over the soup a bit at a time as you enjoy it.